This is my 4th TCCSA science fair (you can see my write ups on the others here, here, and here). However, this represents the first time I was able to attend when the students were presenting their posters to the judges. Of the 23 (one for each human chromosome?) posters, I was able to talk with about half in some detail. Not surprisingly talking with the kids was a blast...well talking to some of the kids was a blast. Like other venues, some kids were truly enthusiastic about what they had done, whereas others not so much. One has to wonder how much the parents forced this latter group into participating and even going so far as to do the work. So from that perspective, the Mall is a useful venue even if, and maybe especially if, it detracts from the science. Regardless, this year the event was held at Northwestern 'College', which (their words) "exists to provide Christ-centered higher education equipping students to grow intellectually and spiritually, to serve effectively in their professions, and to give God-honoring leadership in the home, church, community, and world." 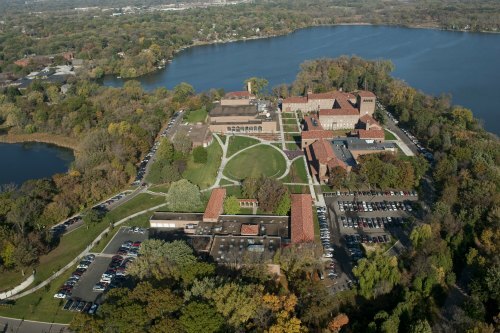 Thus, Northwestern College seems like the perfect place for the religion-as-science fair. 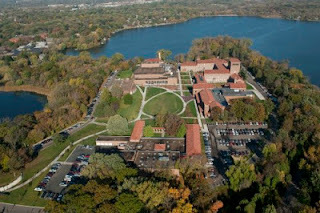 The campus is adjacent to Little Lake Johanna and quite pleasant/quiet. I jogged around it a few times last summer and look forward to it again when winter is over. The plus is that the environment was more conducive to looking at the posters and engaging with the people there. Northwestern College is also close to a favorite watering hole for the post-fair recuperation drink. So I arrive and started looking at posters. When a poster had a student standing by it with no one showing an immediate interest, I went there and asked the student if they would tell me about their work...and now we enter the realm of any K-12 science fair occurring at (a diminishing number of) schools all over the country. We have the good and the bad. This fair represented age groups from around third grade to junior/high school I'm guessing, so the level was quite diverse. There were two categories: experimental and report. The reports, regardless of venue, tend to bore me because I find it difficult to engage the student in the process of science. There were two of this type that I recall: one on butterflies and one on cranberries (I learned that cranberries grow and are farmed in bogs!). Neither student for these posters was available when I was in the vicinity. The experimental covered a range of science. We had the standard 'what freezes first? warm or cold water' Spoiler Alert: It's cold water, and a study on the 5 second rule (see below). Notably absent was the 'do plants grow better when music my parents like is played?' project. 1. the 5 second rule presented by a young woman (Im guessing 4-6th grade range). She conducted several experiments and even had some important controls included. She was familiar with the literature on the topic and was clearly well prepared. Most importantly was her enthusiasm, I was exhausted by the time she was done. It was a lot over the top, but compared to so many student posters, including graduate students' at professional meetings, this was a breath of fresh air...albeit at ~100 mph so maybe a tornado of fresh air. 2. One young man studied the parallax effect using trap shooting as a model. Basically he had people shoot clay pigeons with either one eye open or the other or both and graphed the success rate. He did replicates and used several different people termed expert and amateur at shooting. I wanted to ask him if he thought practice had more to do with it, but he was also not around when I there. This idea was supported by his data where the amateurs' success wasn't altered by a change in eye usage, whereas the experts' were. I liked this project because it tried to look at something interesting using readily available resources. Based on the pictures, he and his family appear to be trap shooting enthusiasts. This seemed liked a great way to combine something he enjoys with some science. 1. The unprepared. These were students who probably had little involvement with their research other than assembling the poster. There were several in this category. I worry about my own son's science projects, because I help him. I know I can come up with experiments/projects for him, walk him through the experiments, and prep him for the presentation. But how does that help him or teach him science? It just teaches him to do what he's told (how I wish for that some days though!). I find asking him questions works best. Ask him what he thinks, ask him about other possibilities to explain his data and then ask what we could do to rule them out. This approach seems to work based on feedback I've received from those who talked to him at his school's science fairs. 2. The I'm too cool for school. There was one of these. The 'let's put a mentos in soda and see what happens' experiment. This young man was clearly one of the older participants. I asked him to walk me through his study and his immediate response was 'Well this is the top left corner, and over here is the top right corner.' Normally I would just be done, but I decided to play. I asked what he wanted to learn and why, we all know it foams up. *crickets* I asked him what causes the foam? *crickets* I asked him in what way he thought his work represented a good example of science in action? *crickets* I then suggested he check out the '5 second rule' poster. 3. The I totally outwitted all those experts. This was the one overtly creationist one I recall. (This is sold as a science fair for home schooled children and I expect some (many?) participants are not necessarily raised by creationists but simply the parents are using the forum to have their kids participate in a science fair.) This young woman, on the older side, was interested in stalactite formation, which some guides at a local cave said took millions of years to form. Well, using a solution of epsom salts she showed that crystals could form within a few days. She then concluded, and I quote, "I proved them wrong." I was polite and asked some methodology questions. I did ask if she thought the stalactites she saw were made from epsom salts and she of course said no. I then asked if she thought that might matter. I spoke with a number of other students, who were great. It's fun talking science and seeing the joy of learning something new in a person's, especially a young person's, eye. The sense of accomplishment with being able to explain something new to someone. Of course at this religion-as-science fair the posters were tainted by the requirement of a bible verse relevant to the science project (which is part of the judging criteria). Prizes were awarded and you could not win based on the fact that the judges were not impressed with your bible verse. Luckily I met up with two friends Greg and Mike at the fair and we relocated to the local pub to decompress afterwards. It was good to end on a high note, especially one that lacked a required bible verse. Update: a reader noted that the original cartoon I inserted made fun of a creation science fair participant. My intention is not to disparage the kids who are the victims in these events. Thus, I replaced it with a more relevant cartoon. Thanks to the reader for bringing that issue to my attention. Need something to do this afternoon?